396 pages | 44 B/W Illus. Today, it is estimated there are over 200,000 volunteers in police work throughout the United States. Although the need for such volunteers has never been greater, there is a lack of published materials regarding the nature of volunteer police work and how qualified citizens may augment police services. 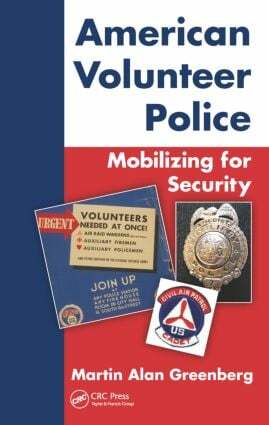 American Volunteer Police: Mobilizing for Security provides a selective overview of the history, organizations, operations, and legal aspects of volunteer police in various U.S. states and territories. Framed by modern concerns for homeland security and community safety, the book places the topic in historical and international contexts. It will serve as a catalyst for the development of courses as well as growth in the number of qualified volunteer police, a necessary resource for homeland security. A 103-page online instructional manual is available for instructors who have adopted this book. It includes model answers to each of the review questions found at the end of each chapter as well as additional student exercises and related updated references. Martin Alan Greenberg has headed criminal justice programs at several universities, having earned his Ph.D. degree from the City University of New York and Juris Doctorate (J.D.) from New York Law School. He has worked as a senior court officer, probation officer, school security assistant, and law clerk. Dr. Greenberg was also a member the New York City Auxiliary Police Force for 12 years, obtaining the rank of auxiliary deputy inspector. His earlier books dealing with volunteer police include: Auxiliary Police: The Citizens Approach to Public Safety (1984) and Citizens Defending America: From Colonial Times to the Age of Terrorism (2005).